Proving that you can find almost any vehicle you want on Ebay if you give it enough time, here is a slightly hotrodded 2008 Koenigsegg CCX. Evidently the owner decided 806hp in a 2600 pound package just wasn't enough. Some people are never satisfied. 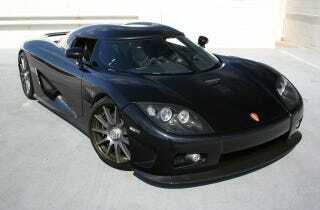 We are guessing the owner of this 2008 Koenigsegg CCX is one of those people. Koenigsegg CCXs are beasts in stock form. Jeremy Clarkson described driving one as "experiencing the terror" and we don't doubt it. The twin supercharger equipped 4.7 liter V8 gets the CCX down the ¼ mile in 9.9 seconds stock and has an estimated top speed of 245+ MPH. This one has received an upgrade from a Koenigsegg factory representative to bump the stock 806hp to an unbelievable 980hp. We aren't sure how sound the logic of wanting more power from a car that insane is, but we like it anyways. There is no indication from the Ebay listing what kind of performance numbers the extra 174hp gives the carbon fiber car but we have to imagine it makes the already scary CCX scarier. Perhaps this is why after 2 years the car only has 441 miles on it. According to the listing, many of the miles on the car were acquired during post production factory testing. It's impossible to tell whether the lack of miles on the car is a result of the owner's desire to maintain collectability or because of a fear of the black beast lurking in the garage. Either way, having one of these and not driving it is a sin, even if it is a prudent decision for your own personal safety. Listed by an Arizona Ferrari dealer, you can be the next one to potentially kill yourself proud new owner and start racking up the miles for a cool $1.15 Million.